Thank you for your interest in attaining an internship with the Connecticut Sports Management Group, Inc. There are multiple internship opportunities available throughout year. With multiple major events (Nutmeg State Games, Connecticut Masters' Games and the Holiday Festival) the need for exceptional interns is great. Come join a young and energetic full-time staff and help conduct the largest multi-sport events in Connecticut. The Connecticut Sports Management Group, Inc. offers paid and non-paid internships, based on hours and workload, which offer outstanding opportunities to gain valuable expereince in sport and event management. Selected interns have the opportunity to earn college credit as well as the necessary experience to compete for positions in the sports world. The Official State Games of Connecticut offering 22+ different sport tournaments and competitions for Connecticut residents. Each summer over 7,000 athletes compete in this unique statewide event! The "Games" will be held throughout July and the beginning of August and is Connecticut's largest Olympic-style multi-sport event. The Official State Games for Master and Senior competitors offering 15+ different sport competitions! Each summer over 1,700 master and senior athletes compete in this annual event! The CT Masters' Games will be held in April, May and June. The Northeast Football Showcase is an annual High School Football Combine for student athletes from all over the Northeast. Our combine provides players with the ability to be evaluated by college coaches while being professionally filmed. The Northeast Football Showcase will be held in late April in central Connecticut. 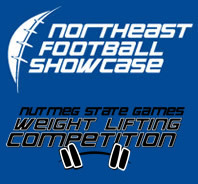 The Nutmeg Connecticut High School Weight Lifting Competition provides 26 High School Football Teams to compete in the Bench Press, Squat and Power Clean Events. Over 600 participants partake in this annual event. The Holiday Basketball Festival is three day competitive Basketball Tournament for 4th, 5th, 6th, 7th and 8th grade boys and girls teams through out New England. The Basketball Tournament Tournament is hosted by Wesleyan University and all games are held in the Freeman Athletic Center. The Connecticut Sports Management Group, Inc. holds three major fundraising events each year which include a $10,000 Cash Prize Raffle (Fall), Golf Scramble (Spring) and our Director's Club Banquet (Winter). Recruiting Teams, Coaches, Athletes, & Volunteers. Corresponding with Coaches, Athletes, Officials, Medical Staff & Volunteers. Scheduling Sporting Events, Officials & Volunteers. ​Perform Game Day Duties as assigned. Supplies, Equipment, Signage, Uniforms & Ticketing. If you are interested in appling for an internship please send cover letter and resume to nutmeg@csmg.org. Please SPECIFY which Internship you are applying for in your cover letter. Interviews will be scheduled for top applicants. Questions: Please call Patrick Fisher, Executive Director at (860) 788 7041.